need some help here, I am looking to use fire buttons with leds on my DNA 250 builds. Cannot seem to find a clear answer on where to solder on the board for the led portion. here in this diagram you can see where at the top right of the fire button you can tap into the LED pads. 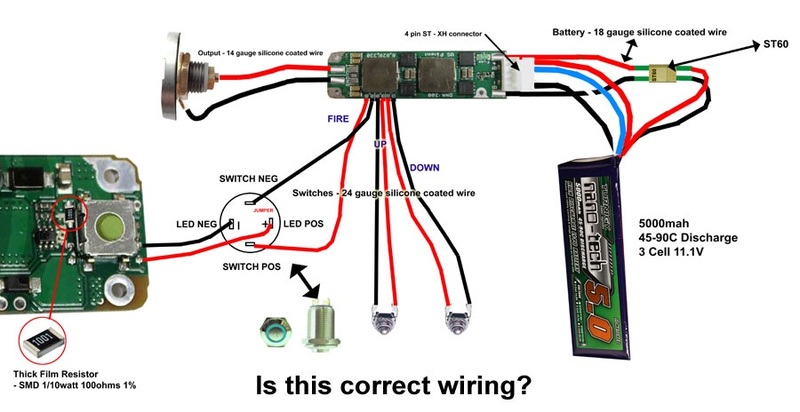 just make sure you have your polarity correct when hooking up LED. thank you. it looks easy enough I suppose. Any suggestions on where to find the resistors? what color is your LED? I'm gonna guess blue???? you need a 100 ohm resistor. red, yellow or green - 75 ohm. got a radio shack near by (?) or just go on ebay and type in "100 ohm 1/10 watt resistor" depending on your soldering skills, maybe get through hole resistors rather than SMD ones. check to see if the switch you're buying already has a resistor inside, you may not need to buy one separately.